Racing Tips: The Slowest Racehorse Ever! We've all heard those positive cliches about the fastest racehorses in training. ''It's been catching pigeons on the gallops''. Sadly the converse can also be true where a horse makes a name for itself because it is decidedly sluggish. That's being polite to one or two who can only be described as horrendously slow. One horse to take this unflattering accolade is A Definite Diamond. 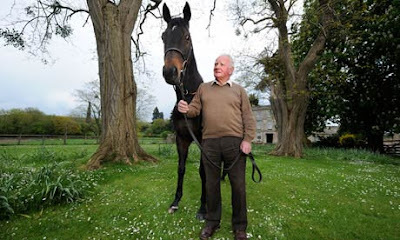 Trained by Milton Bradley, pictured with The Tatling, who raced 176 times, won 18 races and achieved prize winnings of £687,000, retiring at the age of 14 when winning his final race at Wolverhampton is a stark contrast to this two-year-old filly. A Definite Diamond is a homebred daughter of Assertive, racing in the black and yellow silks of beleaguered owners Paul & Ann de Weck. The chestnut filly must have been struggling to catch snails at Sedbury, Gloucester. And definitely not a girl's best friend. Racing over a variety of distances - from 5f to 1 mile - she has finished last in each of her six starts to date. She's been trounced by 54 horses, more than 200+ lengths. In her most recent effort at Bath, over the minimum trip, she showed healthy pace only to tire at the two-furlong pole some 23 lengths behind her nearest rival. Sadly this March foal hasn't escaped her harshest critic on the racecourse - the official handicapper. The higher a horse's rating the better its ability. A horse rated 60 has to be considered poor. So what is the rating of A Definite Diamond? It doesn't look good. In fact, it is terribly low. Amazingly she has been given a rating of just 1. Is she the slowest horse in racing? Luckily her owners have tasted victory with 7 winners since 2003. The best of their horses named April Ciel, although he is trained by Ron Harris. Sometimes Diamonds aren't a girl's best friend.